I decided to add a little flash back from the past while playing on our Just Cause 2 multiplayer server. You can now take a break from all the exploring and destroying and discover our great version of the classic game Pong. To obtain access you must first be a member of our Steam group http://steamcommunity.com/groups/gaveroid. 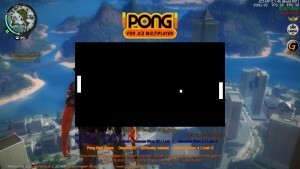 Once you have joined our Steam group and connected to our JC-MP server at jc-mp.gaveroid.com type /pong [difficulty] in chat. You can choose from six [difficulty] levels, amateur, easy, medium, hard, veteran and pro. You against the CPU. First one to win 5 games wins the match. There are no limits to the number of matches you can win. Use your mouse to move your bat, click either mouse button to pause the game. While playing hit the X key to exit. Hit the H key for help. Once you have won a match you can press the C key to continue playing pong at your current difficulty level. To select another difficulty level you must exit your current game by pressing X then type /pong [difficulty] in chat again. Only your highest score no matter what difficulty level will be saved. 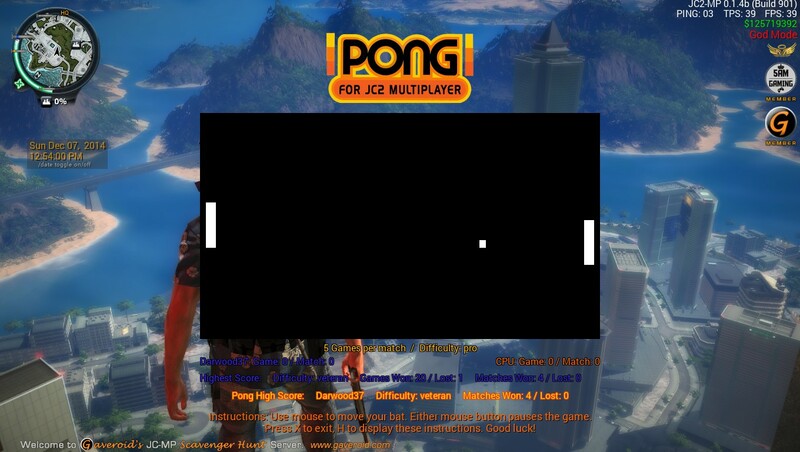 While playing pong your player will be in passive mode, this means you cannot be killed/harmed or kill/harm other players. The game also keeps track of the overall high score and if you manage to beat it you will receive $100 to use in game via the buy menu.